Our niece, Minnie Keira, is OBSESSED with Minnie Mouse! 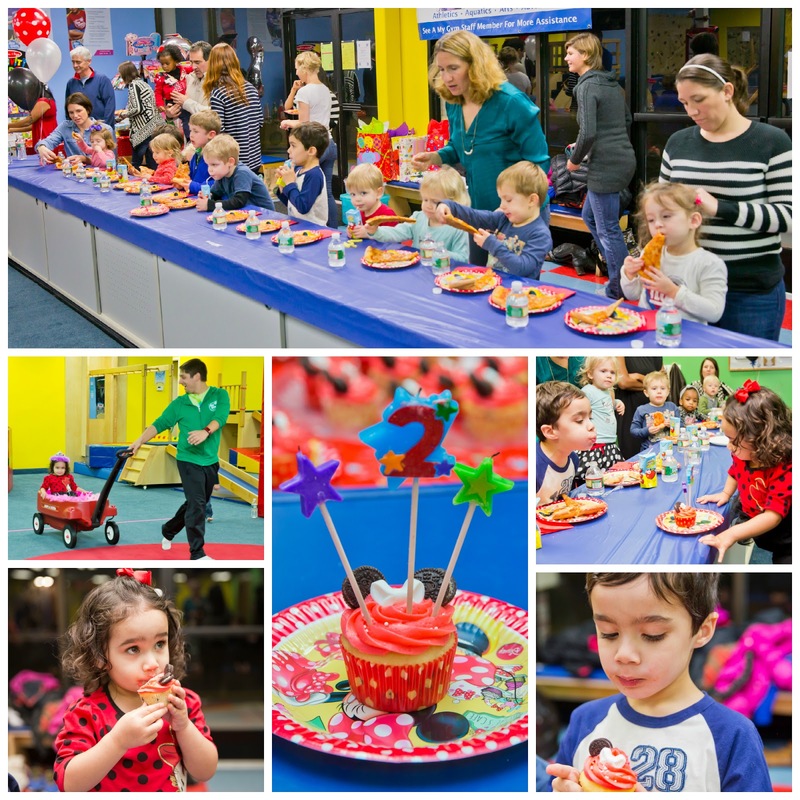 For her second birthday, we celebrated with an OH “TWO”DLES party at My Gym Children’s Fitness Center. 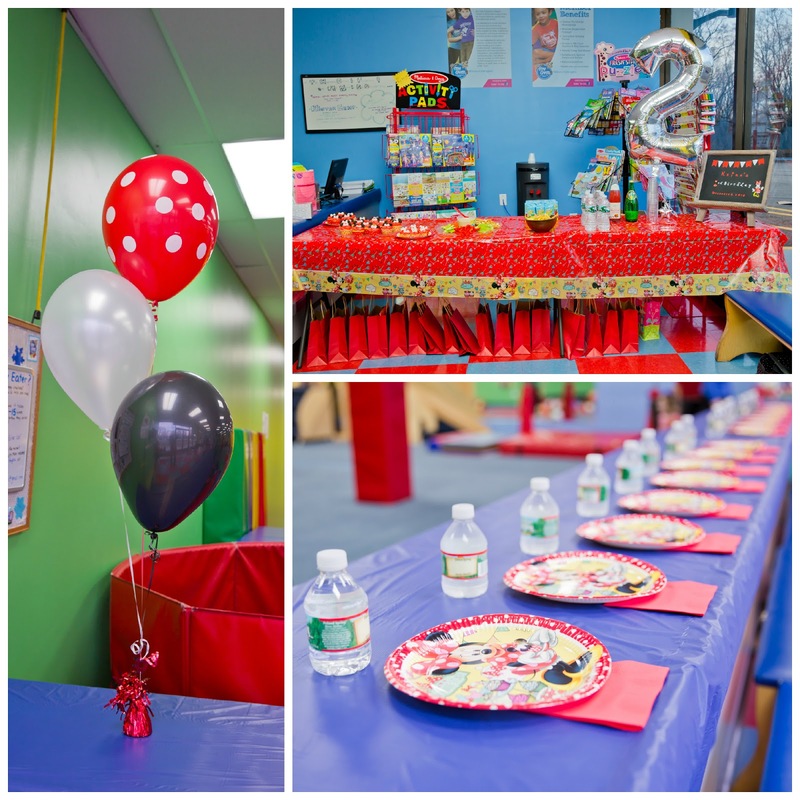 Toddler gyms will handle EVERYTHING at a birthday party from setup to entertainment to cleanup. Some parents LOVE this as it requires minimal effort on their part. BUT, we wanted to make this party extra special with some TWINSPIRATION. Lucky for us, My Gym allowed us to incorporate Minnie Mouse inside the fitness center. We selected a red, white and black color palette to represent Keira’s favorite Clubhouse character, Minnie Mouse. 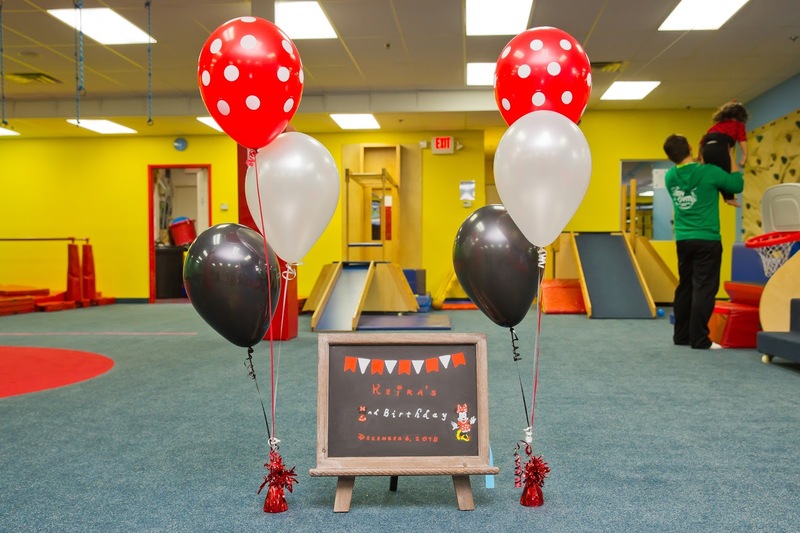 We scattered red, white and black balloon bouquets around the room and decorated the children’s dining area with Minnie’s Cafe tableware. We also placed two Minnie’s Cafe tablecloths, a silver mylar ballon and our Minnie Mouse chalkboard on the buffet tables. 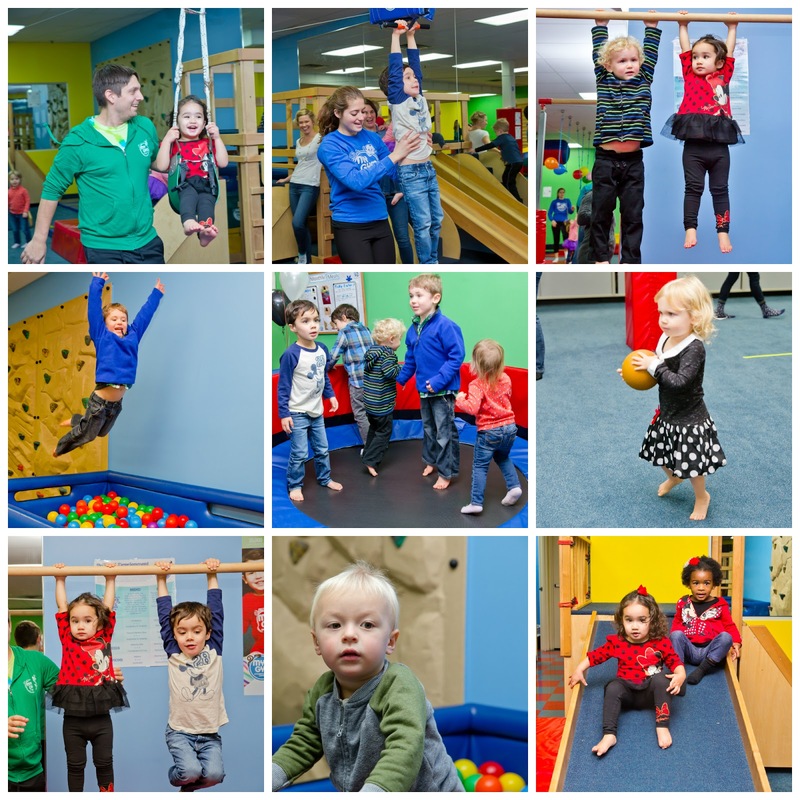 Birthday parties at children’s gyms typically run 90 minutes with an hour for entertainment and 30 minutes for food and cupcakes. We served some light snacks for adults and children to munch on before the pizza arrived. The birthday girl and her friends had full access to the facility. Some of Keira’s favorite activities were zip-lining, sitting in the swing and hanging from gymnastic bars. 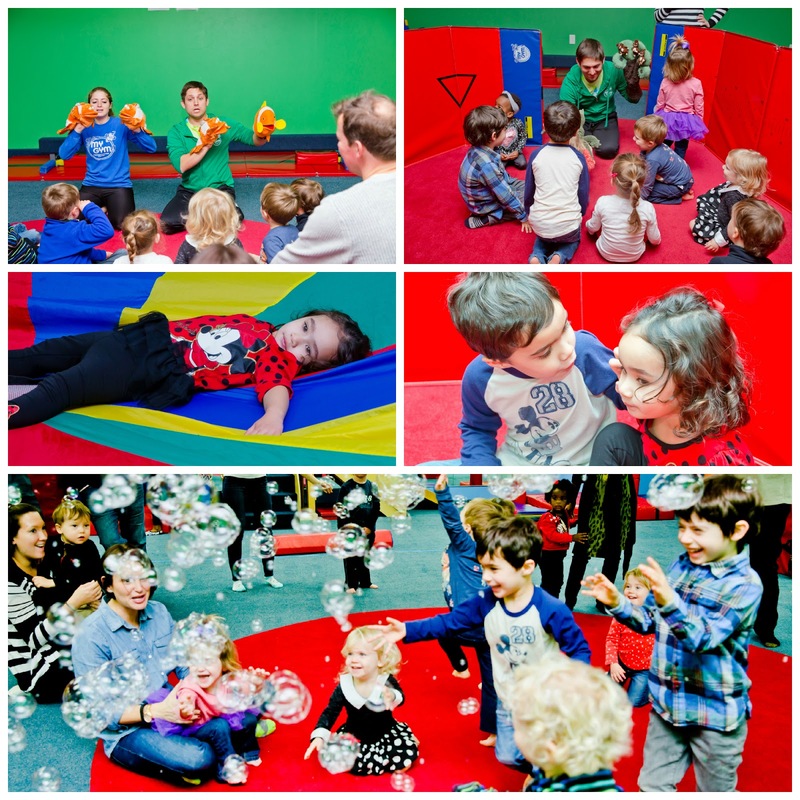 The staff played a number of games, sang songs, performed several puppet shows and concluded with bubbles! After pizza, the kids devoured Baked by Archana Minnie Mouse cupcakes. Archana created vanilla chip cupcakes with a red buttercream frosting. We created Minnie’s ears from mini-Oreos and topped each cupcake with signature white chocolate bow. We also sprinkled some white pearls for Minnie’s polka dots. Since adults prefer a smaller bite of sweetness, we created a mini version of the Minnie cupcakes. Each child left with a Minnie or Mickey filled Goody Bag. 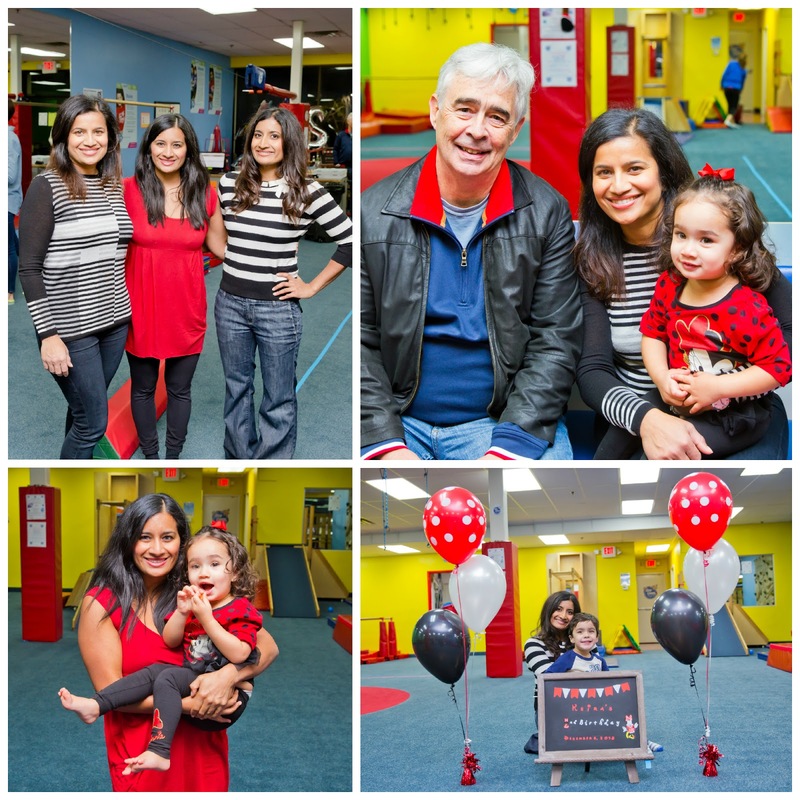 The entire family had a blast at Keira’s Minnie Mouse birthday celebration! Minnie Keira had another celebration on her actual birthday. We baked a cake in the shape of Minnie Mouse. This cake was easy to make. All you need is a small round cake pan, plus two smaller pans or ramekins to bake the ears. 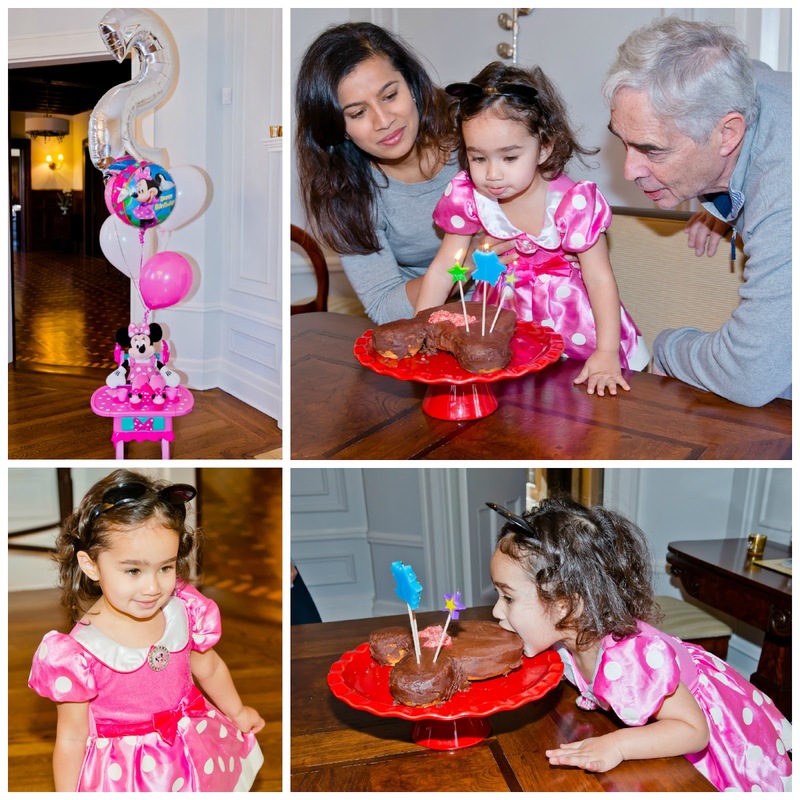 Keira was happy to help Archana bake, and even more excited to blow out her candles and devour her Minnie Cake. Previous Post Eat, Drink and Get Stuffed!